First class is free with $10 boot rental. Space is limited. RSVP is required to attend. The class will consist of cardio, agility drills, core training, and a whole lot of new exercises! A 1 hour class burns approximately 875 Calories! All ages and ability levels welcome. Thank you for supporting your local business. *With the purchase of the Kangoos you will receive free instruction, fitness tips and videos on how to use the Kangoos. 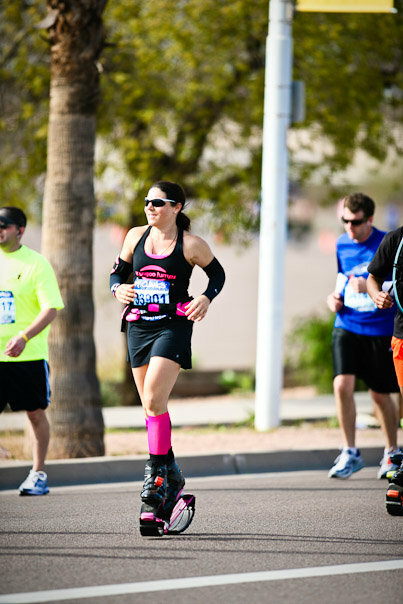 Get Jumpin' with Kangoo Club AZ and Kangoo Jumps!! You are probably all thinking to yourself what the heck are Kangoo Jumps? Simply put, they look like Rollerblades with big circular springs on the bottom! They have been featured on TV shows such as Martha Stewart, Dr. OZ, Extra, The Today Show just to name a few! They are a ton of FUN and ANY age from 6 to 109 can use them!! 6) Cleaning House with a little extra "Pep in your Step"
7) and of course....Kangoo Jumps are great for going out Dancing!!! Where can I try these Bouncy Kangoo Shoes?? We are located in the Arcadia Area at 40th Street and Camelback. Please contact us at 602.348.2330 for more information. Get Jumpin'! Have FUN, Getting FIT!!! !